WHAT’S GOING ON? Toddlers live in the here and now. They don’t wait well. They don’t understand or appreciate the concepts of soon and later, as in, “Soon we will be getting on a plane,” or “Later this month, we’ll go to the beach/lake/amusement park.” They only understand now. So again, taking a toddler POV is the key to getting from here to there with as little fuss as possible. WHAT YOU CAN DO TODAY: What I’ve learned over the years and from hundreds of parents of young children I’ve met along the way is that the secret to a stress-free family vacation comes down to preparation, realistic expectations and distraction. Plan trips around nap or night sleep times. What time you travel absolutely matters. My cousin took a 7-hour car trip with her 3-year old and an infant. Sounds potentially awful, doesn’t it? But because they left at 7PM, both of the children slept much of the way. My husband and I often took early morning flights. We’d rouse the kids from bed before their normal wake-up time and then they’d often fall asleep on the plane (and I could actually read a magazine!). Consider your child’s sleep schedule and plan travel with those snoozing hours in mind when you can. Feed your toddler well. A hungry toddler is not a happy toddler. Before you hit the road, fill up his or her tummy, and then take ample snacks that you can stretch out over a period of time (always plan for potential delays). Small snack containers or baggies that can be pulled out one by one are fun for your toddler to open. Varied food is good: cut up grapes, cheese pieces, crackers, and other finger foods that will happily occupy your child and distract them. Airport lines can be long and this is when pulling out a food treat (I used lollipops to manage long lines when mine were young) can help your toddler manage the wait. Every 20 minutes, create a distraction. Whether you are in a car, on a train or plane, long hours of sitting is nearly impossible for a toddler. I follow the 20-minute rule and I set my watch by it. Offer a new book, snack or activity every twenty minutes. Yes, this creates some busy work for you, but your toddler is more likely to stay quiet, content and entertained (for 20 minutes, anyway). Music and Sound. Download your child’s favorites or take CDs. Listen; Sing along. Recorded children’s books work well, too. When ours were little, we got them each a set of headphones and even now they still listen to music when we travel. iPad user? Decide which games or movies you want to load and be sure you and your spouse agree on the amount of screen time you want to allow during the trip. I suggest saving it for later when you really need it. Magazines & Books. On airplanes, make use of the catalog in the seat back. We spent many plane rides doing this. It is filled with many pictures. You can look for animals (many dogs & cats), watches & clocks, or something else your child likes. Bring along books, too. Some favorites and a couple of new ones will make for a bonus distraction. Play ‘I spy‘. ‘I spy something green.’ It can be grass and trees outside or a jacket on the seat in front of you. Look for letters or numbers on billboards. Start with 1 and it will take time to get to 10 or higher. Look outside the window for animals, trucks, signs, etc. 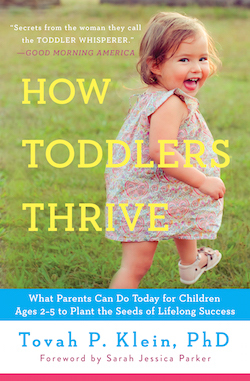 Toddlers are visual, and looking and finding is something they enjoy. Art supplies. Stickers and tape, crayons and erasable pens. Stick and draw on pads of paper, index cards or post-it notes. A doodle sketch board is a board with a ‘pen’ where your child can scribble or sketch and then erase. Older ones can write letters and names. Play-Doh is also entertaining to toddlers. Spread it out on the plane’s tray table, and let them go to work. Surprise boxes. Pack small containers with fun things to do- a car, plastic animal toy, stickers, shells. Toddlers like opening boxes and finding things inside. Your local dollar store is a great place to find surprises to put inside small boxes. Involve your child. Let your toddler pack a small carry-on or backpack with a few toys of his choosing. When they get to choose, it helps them feel included and gives them that sense of control they crave. Be sure their lovey is in it, too. Play Airplane. If your toddler has an EXTRA hard time sitting and staying entertained, try practicing the routine of getting on a plane, buckling seat belt, listening to the voice who tells them they have to stay in their seat and so on. Do it as a game for practice and give them a chance to tell you what to do as well. Knowing the routine and letting them have control through play can make for a smoother ride. Have summertime travel insights of your own? I’d love to hear what works (and doesn’t) for your family. Share your comments on Facebook or Twitter.